An evening reception was held at the Scottish Parliament last week to celebrate Cloch’s 50 years as a social housing landlord in Inverclyde. The celebration, sponsored by Greenock and Inverclyde MSP, Stuart McMillan, included a mixture of speeches, awards and creative works. Cloch guests included staff, Board members, tenants, other Inverclyde Associations and the Provost of Inverclyde Council. 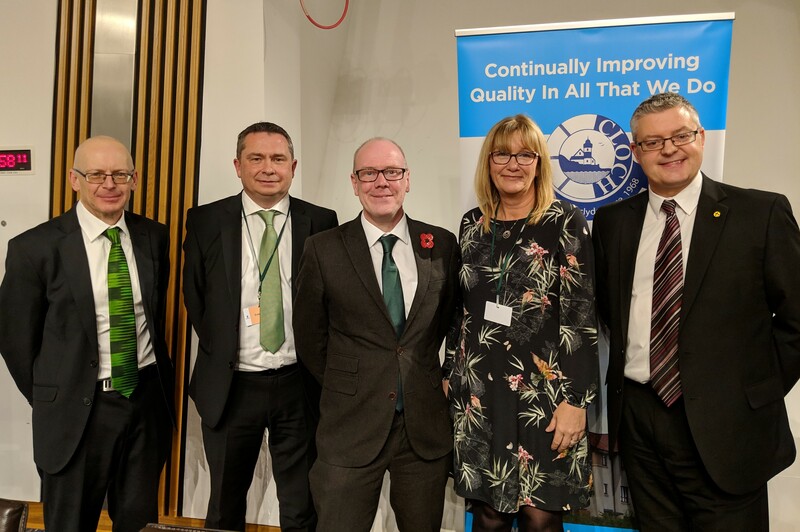 The Housing Minister, Kevin Stewart MSP, also attended and said a few words to mark the many achievements and the impact on Inverclyde of the Association over the last 50 years. The evening was opened by the local MSP who was delighted that Cloch and its visitors were able to come along to the Parliament. He acknowledged the great work that Cloch has achieved in improving the lives of so many in the Inverclyde community. As part of the event, David Bookbinder, Director of Glasgow and West of Scotland Housing Forum, presented staff from Cloch with two awards which had been achieved in 2018, the Customer Service Excellence Award and the Award for Healthy Working Lives. “These awards are a recognition of the hard work which has gone into our Customer Facing Project over the last couple of years. Our service delivery model has been enhanced and our customers are really noticing the difference. The guests had the opportunity to see a new short film about Cloch, which has been produced in conjunction with TIS, and is available to view on Cloch’s website. A short presentation was also given by Liz Bowden, Cloch’s Corporate Services Manager, on a new Cloch heritage book. “The Cloch Book: Souvenir Edition” has taken stories from staff and tenants and turned them in to comic strips and mini histories of Cloch and Greenock over the past 50 years. The Book was fully funded by a grant from the Heritage Lottery Fund and put together by Inverclyde company, Magic Torch. Guests enjoyed a hot buffet and some refreshments before heading home.